Access the various minerals industry information gateways below. 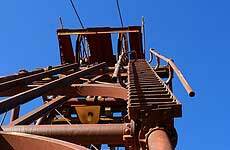 Provides the latest mining safety information. MIRMgate allows you to quickly find what you are looking for by cross referencing by Subjects, Tasks, Hazards. Extensive cross-referencing of relevent safety information. The logical starting point for most searches. EMESRTgate provides access to information about the EMESRT Design Philosophies for exploration and mining equipment design. TYREgate is a world first earthmover tyre and rim related searchable Causal Factors Database which provides the mining industry with a unique, up-to-date and complete source of information about earthmover tyre, rim safety and maintenance improvements. Incidents and accidents related to isolation across a range of energies continue to occur within the Minerals Industry. ISOLgate is designed to assist the mining industry including equipment manufacturers, and service providers, in developing more effective isolation strategies. COMPLIANCEgate has been established as an online national database of guidance material, where anyone with a duty to comply is able to search for relevant information that may assist in fulfilling that duty. COMPLIANCEgate is one strategy of The National Mine Safety Framework (NMSF) initiative of the Ministerial Council on Mineral and Petroleum Resources (MCMPR). Australia, China, India, Japan, Republic of Korea, and the United States of America (USA) along with the newest partner, Canada have agreed to work together and with private sector partners to meet goals for energy security, national air pollution reduction, and climate change in ways that promote sustainable economic growth and poverty reduction. APPgate presents the project reports in an online format. Other gateways are in development and will be available via this website as they are completed. We all know that we get essential nutrients from the foods that we eat. But, how does the body process the nutrients from that food and put it to use? The liver is responsible for this function. As soon as we eat, our digestive system begins to immediately break down food into progressively smaller pieces. The nutrients from these food pieces are then sent to the bloodstream where they make their way to the liver through a pathway known as the hepatic portal system. At this point, the liver will then begin to process those nutrients in a variety of different ways depending upon what the body needs. In most cases, at least some of those nutrients will be stored so that the body can use them for quick sources of energy later. The remainder of the nutrients will then be utilized to produce essential chemicals that the body also needs. In the event that the liver is damaged or is not working properly then it is unable to process the nutrients that are sent its way through the blood system. As a result, the body is unable to receive the essential nutrients that it needs. In very serious cases, serious health issues can arise such as brain damage. Furthermore, if your body isn’t processing nutrients properly, your metabolism isn’t going to be functioning as well as it should be and this could increase the risk of body fat gain. The liver is also responsible for producing bile. Bile is a thick substance that is greenish-yellow. It is produced by the liver for the specific purpose of helping to digest food, particularly fat. Although the liver produces bile, it is actually stored in a sac located near the liver known as the gallbladder. If you’re able to process fat better, you’ll have a greater chance of using the energy you consume through dietary fat, rather than storing it. The liver is also responsible for building proteins, which are essential to the human body. Proteins are important for many important bodily functions, including the clotting of blood. When the liver does not work properly, blood is not able to clot effectively. At worst case scenario, this can be a very serious and life threatening condition. In addition, the liver is responsible for removing toxins from the blood as it passes through the liver. All of the blood in the body will eventually make its way through the liver so the removal of these toxins is going to be essential for you to be functioningyour best. If your liver is bogged down by too many toxins, then it starts to shuttle toxins out to fat cells. Guess what happens next? The fat cells get bigger and you get weight around your belly. So as you can see, taking care of your liver is very essential for proper health as well as to helping to boost the rate of fat loss you see through better nutrient processing and enhanced protein generation. If you’ve made the decision that you’d like to start up on a liver Phen375 diet, it’s essential that you’re learning how to follow it properly for results. Each Phen375 diet is going to have its own particular protocol and by adjusting yours to match what’s required with this diet, you will see faster results. Let’s go over what you need to know.